Background: The incidence of esophagogastric junction cancer(EGJC) is rising dramatically both in western countries and in China. For siewert type I EGJC, the optimal procedure is Ivor-lewis operation. For type II EGJC, the surgical treatment is still controversial. Transabdominal proximal gastrectomy is the most popular procedure in China. Although a clear margin at the esophageal end can often be obtained with the use of stapler transbadominally, it is difficult to perform the esophagogastric anastomosis when cancer involvement of distal esophagus is longer than 2 cm. More important is that a longer proximal margin of esophagus(4 cm) has been reported to be asscociated with a better 5 year survival rate as compared with a shorter one(2cm). 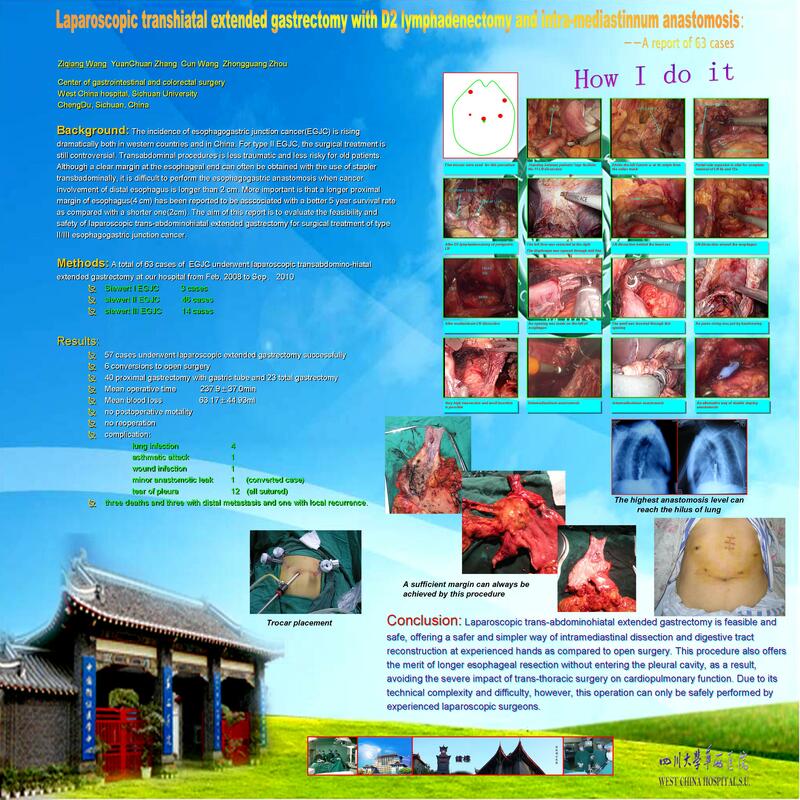 The aim of this report is to evaluate the feasibility and safety of laparoscopic trans-abdominohiatal extended gastrectomy for surgical treatment of type II/III esophagogastric junction cancer. Methods: A total of 63 cases of EGJC(including 3 cases of type I EGJC, 46 type II and 14 type ?) underwent laparoscopic transabdomino-hiatal extended gastrectomy at our hospital from Feb, 2008 to Sep, 2010. After laparoscopic mobilization of stomach and D2 lymphadenectomy, the esophageal hiatus was opened by cutting the diaphragma from the midline and bilateral crura diaphragm. The pleura was pushed sideways and protected. The postmediastinnum space was enlarged, allowing for the mobilization of distal esophagus up to the level of inferior pulmonary vein and sampling of lymph nodes in the mediastinum. The anvil of the stapler was then inserted into the esophagus through an opening, follwed by manual putting of purse string. A small incision was made to bring out the stomach and to complete the anastomosis. Pneumoperitoneum was then reestablished to complete the esophgogastric anastomosis. Results: 57 cases underwent laparoscopic extended gastrectomy successfully, with 6 conversions to open surgery. A safe anastomosis up to the level of inferior pulmonary vein to hilus of the lung can be always achieved. There were 40 proximal gastrectomy with gastric tube esophageal anastomosis and 23 total gastrectomy. The mean operative time was 237.9±37.0min , and the mean blood loss was 63.17±44.93ml. There was no postoperative motality, no reoperation. There was only one converted case developing minor anastomotic leak postoperatively which healed up in one week without reoperation. 12 patients had tear of pleura during operation and managed successfully by suturing. Four patients had lung infection, one had asthmatic attack, 1 had wound infection. The other patients all had uneventful recovery. All patients were followed up, with three deaths and three with distal metastasis and one with local recurrence. Conclusion: Laparoscopic trans-abdominohiatal extended gastrectomy is feasible and safe, offering a safer and simpler way of intramediastinal dissection and digestive tract reconstruction at experienced hands as compared to open surgery. This procedure also offers the merit of longer esophageal resection without entering the pleural cavity, as a result, avoiding the severe impact of trans-thoracic surgery on cardiopulmonary function. Due to its technical complexity and difficulty, however, this operation can only be safely performed by experienced laparoscopic surgeons.